Croquet tornament in pilsen! I had so much fun, and it was such a magnificent day. chistopher's courtyard is a magical shared space, and i got very drunk. i was relieved to see costumes weren't really required. 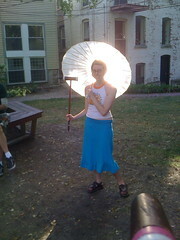 but christopher does believe parasols are a necessity at any croquet gathering.